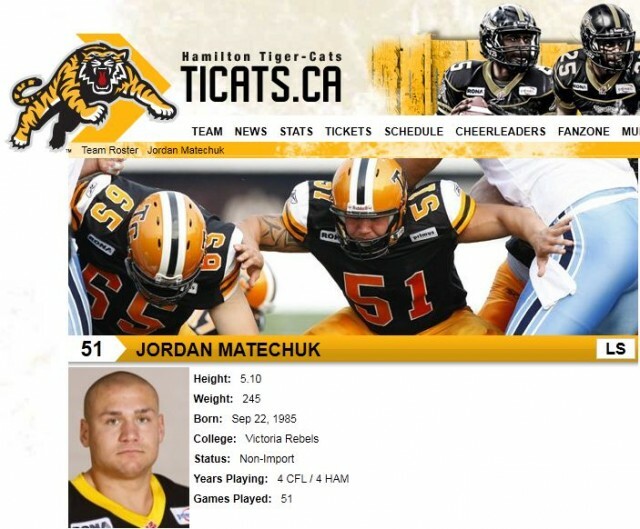 Jordan Matechuk publicly apologized to the Canadian Football League, the Hamilton Tiger-Cats franchise and his friends and family a few days after pleading guilty to the possession of anabolic steroids and marijuana. Matechuk was arrested after customs officials busted him in possession of 543 steroid tablets and 263 milliliters of injectable steroids. His attorney advised him to avoid answering questions while his legal case was still pending. Matechuk, hoping to rehabilitate his image, nonetheless decided to answer a few questions in an interview with the Associated Press. Matechuk’s cryptic statements, rather than facilitate closure on the unfortunate steroid case, opened the door for further questions about the alleged quantities of steroids that were destined for Hamilton. While there has been some speculation that the steroids may have been destined for teammates in the Tiger-Cats organization, Matechuk seemingly took responsibility for the steroids found on his possession deflecting suggestions that he planned on sharing them with anyone else. Matechuk is scheduled to be sentenced on August 24th. He faces up to two years in prison on the felony steroid count and up to one year in prison on the misdemeanor marijuana count. Perhaps, he will tell the other “side of the story” after he is sentenced.